The Sony XC-505 is an industry standard for machine vision applications requiring a ruggedized, compact packaged, analog color CCD camera with RS-232 control features. The Sony XC-56 is the industry standard for machine vision applications requiring a progressive analog CCD camera. Exclusive from Industrial Camera Sales, we extend the standard 12 month Sony service warranty with an 18 month replacement warranty. 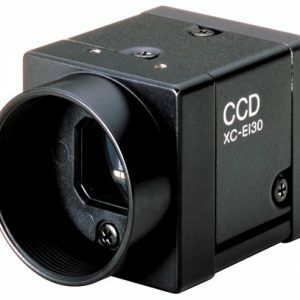 The Sony XC-Ei30 is one of a handful of near IR ruggedize cameras available for machine vision applications requiring a 1/3 Format interlaced analog CCD camera. The Sony XC-Ei50 is one of a handful of near IR ruggedize cameras available for machine vision applications requiring a 1/2 Format interlaced analog CCD camera. The Sony XC-ES30 is an industry standard for machine vision applications requiring a 1/3-inch format interlaced analog CCD camera. The Sony XC-ES50 is an industry standard for machine vision applications requiring a 1/2 format interlaces analog CCD camera. The Sony XC-EU50 is one of only a handful of ruggedized ultraviolet sensitive cameras available for machine vision applications requiring a progressive analog CCD camera. The Sony XC-HR50 is an industry standard for machine vision applications requiring a progressive scan analog CCD camera with full frame rates up to 240/sec. The XC-HR57 is a high speed progressive scan camera with a 1/2-inch format VGA CCD Array. Light weight and ruggedized it has a full frame rate of 240 Hz, and 480 Hz in binning model. Similar to the XC-HR57, the Sony XC-HR58 is a high speed 1/2-inch format SVGA industrial camera which can achieve a full resolution (767×580 pixels) frame rate of 200 Hz, or 300 Hz in binning mode. It's light weight, has a C-Mount lens and progressive scan output. The XC-HR70 is a high speed progressive scan analog camera designed for machine vision applications. It's 1024×768 (XGA) CCD sensor array can achieve frame rates of up to 120 per second, and 180 frames/sec in binning mode. The HR70 is designed for rugged use with low failure rates. The Sony XC-HR90 is an industry standard for machine vision applications requiring a 1/3 Format high speed, high speed, progressive analog CCD camera.